The name Asha Bhosle is synonymous with peppy and sizzling number like Dum Maro Dum …, Yeh Mera Dil Pyar Ka Diwana…,Piya Tu Ab To Aaja…. So one may wonder how could Asha Bhosle sing the complex ghazals in UMRAO JAAN so effectively that fetched her National Award. Asha Bhosle’s command over seductive and fast numbers has been so commanding that even the new generation music maverick A.R. Rahman could not resist and employed her for the sizzling song Tanha Tanha Yahan Pe Jeena Ye Koi Baat …(RANGEELA). Truly when the song was picturised on Urmila Matondkar it brought out the sensuality of Urmila Matondkar in her voice vividly and created magic. 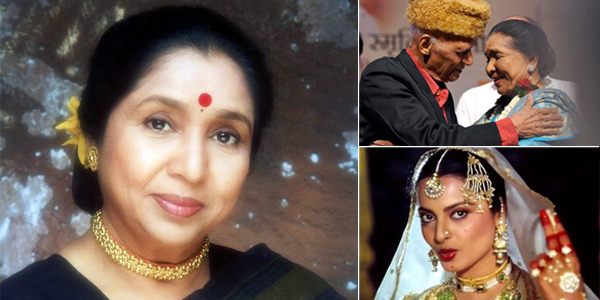 Asha Bhosle’s elder sister and Melody Queen Lata Mankeshkar too credit Asha’s mastery over such songs that have helped her escalate to dizzy heights of stardom. Interestingly while Asha Bhosle’s forte has been fast and peppy numbers what is commendable about Asha Bhosle is her ‘equal’ mastery in Indian Classical music. Of course the credit for which goes Khayyam, the music legend, who made her immortal in his film UMRAO JAAN. Remember the super hit ghazals like Dil cheez kya hai…., In aankhon ki masti ke…, Ye kya jagah hai…, Justju jiski thi…. The movie fetched her National Award and the world was left dumbfounded at her command over ghazal and Indian Classical music.